My name is Facia Sirleaf, and I'm a witness to the power of education. As a child, I saw how my beautiful homeland of Liberia was devastated by war and a lack of educational opportunity. As a young refugee in Ghana, I was introduced to formal schooling and the power of learning to read and write for the first time. As an immigrant and now a citizen of the United States, I've experienced how the opportunity to receive an education can help make dreams possible. As a rising junior at Delaware Valley Charter High School in Philadelphia, I see great value in my education in helping me pursue a career in Forensic Anthropology. 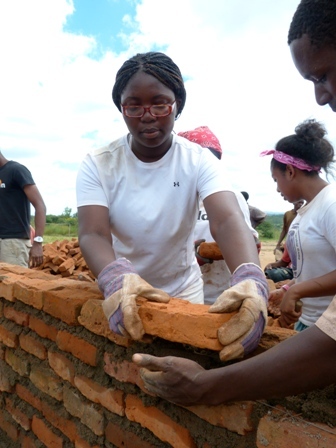 My passion is driven by my upbringing, as well as my recent experience traveling to Malawi with buildOn, an organization that I've been volunteering with since I was a freshman. In April of this year, I traveled to Jembe village in Malawi with buildOn to help build a school, learn about culture, and study why education is important to development. I lived with a host family and spent two weeks working side-by-side moms and dads who just wanted to improve education for their kids. What I learned, I will never forget. I found that people from the U.S. and Malawi share several things in common; however a lack of opportunity and poor education systems are destroying potential. I saw dedicated students in the village studying day and night just for the small chance to go to secondary school. I made friends with young girls from the village, knowing that each year of primary school they were able to finish, their chances for a better life would be improved. I will always remember that, and most of all I will never forget how lucky I am to have access to education and all the opportunities I've had in my life. As I get ready for the first day of school in Philadelphia, I can't help but think about the students attending school in Jembe, Malawi. While our first days of the school year will no doubt be very different, our goals are the same-to use education to improve our own lives. Facia Sirleaf is a rising Junior at Delaware Valley Charter High School in Philadelphia. Born in Liberia, Facia moved at a young age to a resettlement camp in Ghana, and later emigrated to the United States with her family. Facia is an aspiring writer and poet, and hopes to study forensic anthropology in college.